“KNOW WHEN to turn back.” Anyone familiar with the axioms of mountaineering knows this is an essential rule of self-preservation. But for rank amateurs battling up their first huge peak, pinpointing that “when” can be tricky. I certainly found it so. Was it the moment I approached a precipitous bulge in the slope, forcing me to fight off waves of dizziness—an attack of vertigo that glued me belly-down against the snow? Was the risk already starting to outweigh the reward? I wasn’t sure. 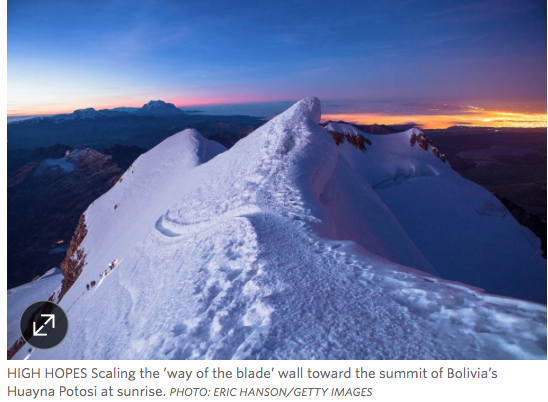 We were climbing the slopes of Huayna Potosi, a snow-capped mountain in Bolivia’s Cordillera Real range. At 19,974 feet, the peak looms higher than every in North America except Denali. And yet, because the route requires only basic technical ice-climbing skills, and because the altitude gain from trailhead to summit—around 4,600 feet over two to three days—is relatively short, it’s often cited as the easiest climb of such altitude in the world. More than 1,000 people, many of them amateurs, summit every year. When my friend Simon and I arrived in La Paz, Bolivia’s administrative capital, after weeks of traveling throughout the Andes, Huayna Potosi seemed an opportunity too good to pass up. Here was the chance to stand on terra firma at the cruising altitude of a turboprop aircraft; to live out the mountaineering dramas I’d been reading about in expedition books since I was a boy. With a mixture of apprehension and traveler’s abandon, we stopped in at one of the climbing outfitters in town and signed up for the next day’s departure. In the morning, our Landcruiser broke out of the city’s traffic-clogged valley and emerged onto the altiplano, the high plateau that spreads from northern Argentina to southern Peru. We continued along an unpaved road, climbing up into the Cordillera Real. Two hours out of La Paz, we stood at the trailhead, craning our necks to take in the boulder-fields that rose before us in a seemingly endless series of slopes and saddles. Our guide, Rolando—a stocky, unsmiling man with a wind-lined face—outlined the whistle-stop itinerary we would be following from here. “This is the start of the eastern route,” he said, his hand delineating a vague zigzag up the mountainside. “Today, we go to a camp at 17,060 feet.” This, representing a climb of 1,600 feet, would be higher than I had ever been before. With the jeep unloaded and a bottle-cap of a throat-shredding spirit spilled at the mountain’s foot as an offering to Pachamama, Mother Earth of the Incas, we set off on the trail. A two-hour trek up a steep switchback brought us to Campo Alta Roca base camp: a platform of shale where the rock met snow and ice of the mountain’s upper reaches. By late afternoon we were tent-bound, wolfing down chocolate bars and bland bowlfuls of undercooked pasta, listening to the wind clatter the fly-sheet of our two-man dome. Sleep was wishful thinking. The lack of oxygen in the rarefied air amplified blood pressure, brought on hypertension and accelerated our heart rates. But it was the anxiety—a stomach-flipping apprehension about the climb to come—that pretty much guaranteed insomnia. I lay with eyes wide open and waited for the call to action. Rolando woke us at 1 a.m., a move both pragmatic (the wind-compacted terrain is firmer in the early hours) and romantic (we wanted to see a summit sunrise). We trussed up in the multiple layers of high-altitude clothing we’d rented in La Paz, and tested the bite of the crampons we’d attached to our boots on a stretch of snow. Up ahead, the head-torch beam of a lone climber was already progressing up the mountain against a reassuringly clear night sky. On Rolando’s advice, I wedged coca leaves into my cheek, an age-old trick used by indigenous Andean peoples to blunt the symptoms of mountain sickness, and crunched off into the gloom. Whether it was the anesthetizing drip of those leaves or the monotony of walking in the dark, I have little memory of the ensuing trek. It was one long trudge over featureless domes of wind-crystallized snow. Mile after mile we plodded upward, reliant on our guide to help us evade the crevasses that lacerated the landscape. Only at 5 a.m., as the glow of sunrise began to cast some perspective on our progress, did the sight of the climb’s final challenge snap me out of the stupor. Suddenly it became clear why we had lugged ice axes with us. Here, within a furlong of our goal, we’d run into a great white wall. This was el paso de la pala, “the way of the blade,” a 600-foot-high, 60-degree slope that stands between climbers and the summit. Already standing at its foot, the other climber, a Frenchman, was in the process of admitting defeat. “Too cold,” he slurred, beating his red mittens together. With a forlorn “bonne chance,” he turned to retrace his footsteps back down. I glanced at my companions. “Let’s at least give it a go,” said Simon. “If it’s too hard after 10 meters [33 feet], we’ll give up.” I mumbled assent, and Rolando took the rope off his shoulder to tether us together at the waist. Within 10 feet of our decision to push on, I was envying our Gallic friend. Within 100, the climb had turned into a gasping, gut-wrenching purgatory, each swing of the ax and kick of the toe-spikes a herculean effort. The trial ended on a narrow podium of virgin snow, just wide enough for the three of us to huddle together. 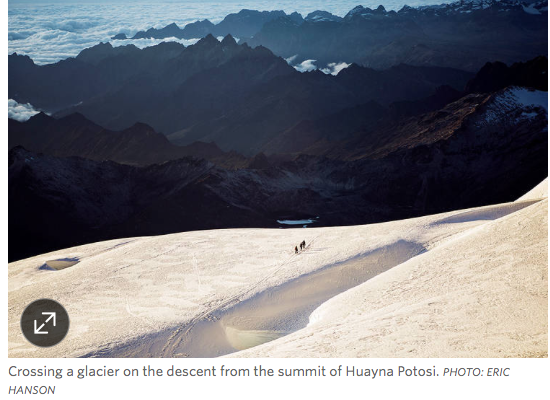 With the white wall on one side and the certain-death plummet of the mountain’s west face on the other, Huayna Potosi’s summit wasn’t much of a place for celebratory hugs and jumps of joy. But vantages like this can make you momentarily forget your mortality. To the north, the early sun revealed the full beauty of the Bolivian Andes, whose archipelago of mountaintops could be seen poking up through the clouds. On their western fringe, a silver crescent marked the shores of Lake Titicaca. South, the urban sprawl of La Paz, where everyday life was waiting. 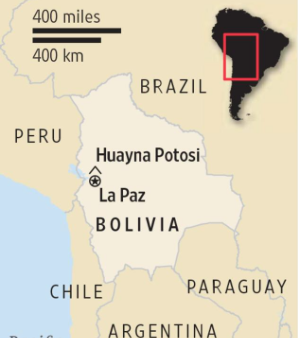 Getting There: LAN Airlines and Avianca both run one-stop flights to the Bolivian capital La Paz (though two-stop options are often significantly cheaper). U.S. citizens require a tourist visa to enter Bolivia. When to Go: The peak climbing season for the Cordillera Real is May to September, when the days are mild and the nights are cold. 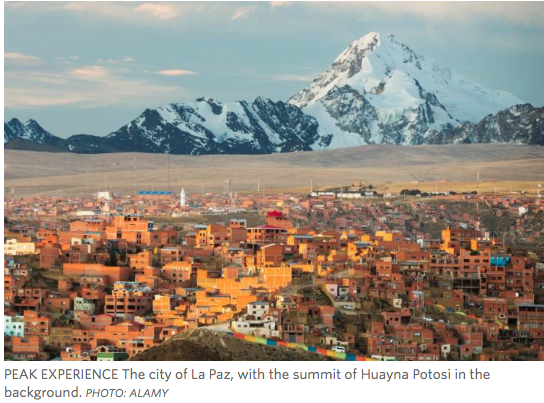 Staying There: La Paz has accommodation to suit all budgets. Hostal Naira, located next to many of the city’s adventure travel agencies on Calle Sagarnaga, is a popular midrange option (from $42 per double room, hostalnaira.com ). If you’re after something more upmarket, try the Casa Grande Hotel (from $290 per double room, casa-grande.com.bo ). Do not hesitate come over! This entry was posted in Bolivia, Environment, Holidays, La Paz, Tourism and tagged high altitude, Huayna Potosi, mountain climbers. Bookmark the permalink.